I cannot believe I am already preparing to go back to school, but I know it is right around the corner. I have been thinking about this little gift for awhile. It is something I would like a parent of one of my students to give me on the first day of school. Once teachers arrive at school, it is almost impossible to leave the building until after the students leave. There are days when you need a little something from CVS and there is no way to get there. 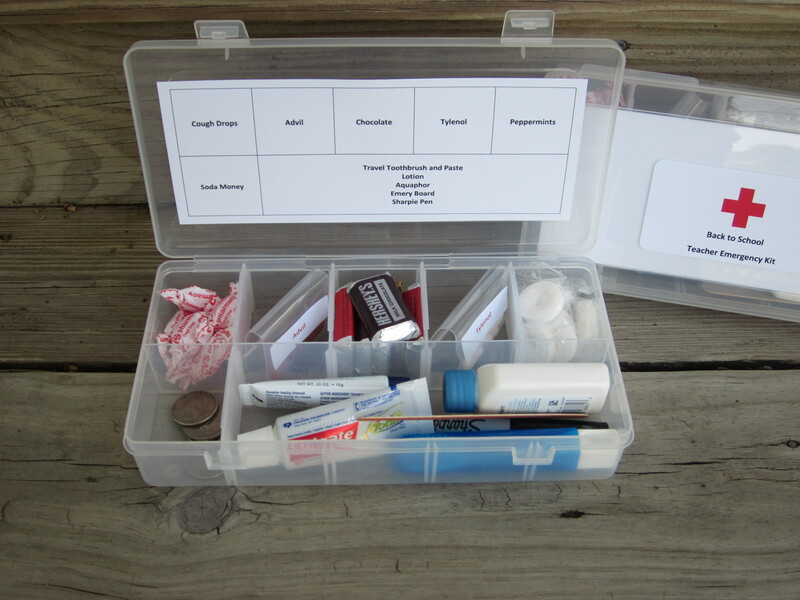 I thought my children’s teachers might appreciate this little Teacher Emergency Kit; I know I would. The Box: I purchased a few bead storage boxes from Michael’s. It has ten slots with removable dividers. I removed a few of the dividers to make one section of the box bigger. The Contents: I chose the contents based on things I need when I am teaching. Below is the suggested list, but I also considered adding things like Band-aids, a good red pen, hair bands or a clippy, Tums, and even a feminine product or two since my children have female teachers this year (but the box was clear, and I thought that might have the potential for an embarrassing situation– although not having that item can create an embarrassing situation too, so you decide). The Labels: I printed a 2″x 4″ label for the lid of the box using the Red Cross logo to make it look like an emergency kit. I created a table for the inside of the box and printed it on cardstock. Using a paper cutter, I cut it down to fit the inside lid and attached it with clear tape. I wanted the “map” on the inside to look like one of those lists they have in the big chocolate candy boxes, so you know what kind of chocolate you are eating. Here is a copy of the teacher emergency kit map. 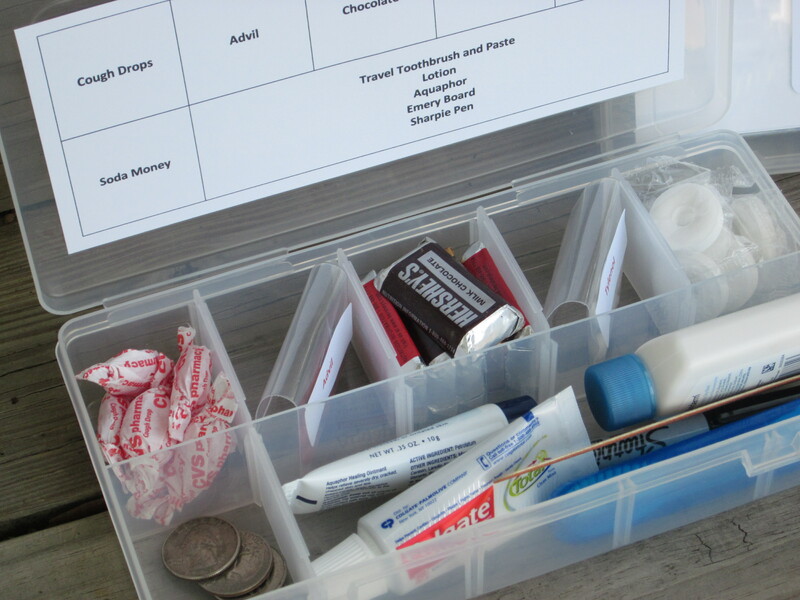 Footnote: I did a little Pinterest research, and (big gasp) I am not the only one with the Teacher Emergency Kit idea. After analyzing my competition, I noticed a few flaws with the other kits’ contents. They often contain colorful paper clips or Starburst candies or things that make the packaging look better, but these items are not that useful. A Starburst is not going to make my breath better after I eat garlic-y hummus for lunch. I don’t need colorful paper clips; I can get a whole box of paper clips in the supply cabinet next to my school’s copy machine. 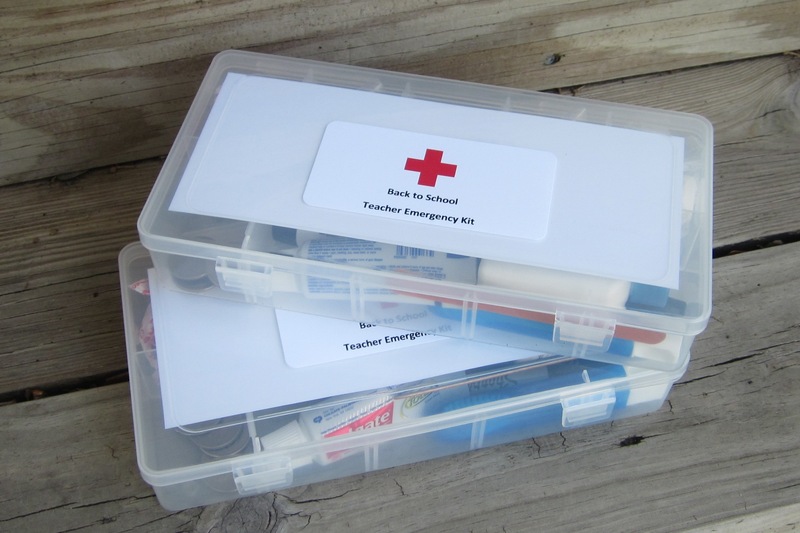 When you fill your emergency kit, think about items that a teacher would not be able to access in a school building and might desperately need. What a great idea! I think I need to do this! I hope it is appreciated! All good additions! Thanks for the comment. Wow, that is the best thing that I have seen in a really long time. I would use this so much more than the awkward body lotion that I get from time to time!! I will REBLOG for my teacher friends! Thanks for sharing! Jillian– Thanks so much for the reblog! I agree. I don’t need “fancy” lotion, but I do need quarters for a Coke when I am having a really tough day. Hope your students and their parents are really nice to you this year. This is the best thing in the world…. You are amazing — do you ever sleep!? Loving this idea! I really need to get a storage box rather than just having things like that piled in my drawer like I do. One thing that would be a great addition is one of those Clorox spot removal pens. I’m good for drinking coffee and occasionally missing my mouth, especially while I’m driving to school. I never think to buy one and always have to borrow one from the secretary in the office…who seem to have one of EVERYTHING in their desks! A friend added a Tide to Go pen to her kits– I posted a picture on FB (https://www.facebook.com/Theroommom?ref=hl). It’s something I am going to add to next year’s kit.